When Neil Layton was growing up, his father always reminded him of his responsibility to give back to the community that supports him. 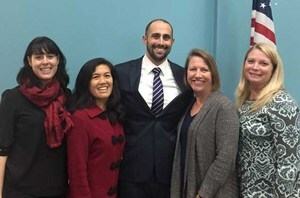 And since moving to San Carlos in 2013, he has taken the advice to heart, serving as a member of the San Carlos Parks, Recreation, and Cultural Commission, the San Mateo County Sheriff’s Activities League, and the San Carlos History Museum Board before winning a seat on the San Carlos School District Board in November. Mr. Layton participated in his first board meeting on Thursday, December 7 after a ceremonial swearing-in for him and re-elected incumbents Carol Elliott and Kathleen Farley. Mr. Layton’s term will end in 2022. Mr. Layton grew up in Castro Valley, California where he attended Castro Valley public schools. After high school, he attended the University of Washington and earned a bachelor of arts in economics and a minor in communications before earning a law degree from the University of Wisconsin – Madison. During law school Mr. Layton served as student body president, and after law school, he became a Deputy District Attorney for Alameda County.